More than 1000 people turned up at one of Auckland’s famous west coast beaches to protest against deep sea oil drilling in New Zealand waters today. 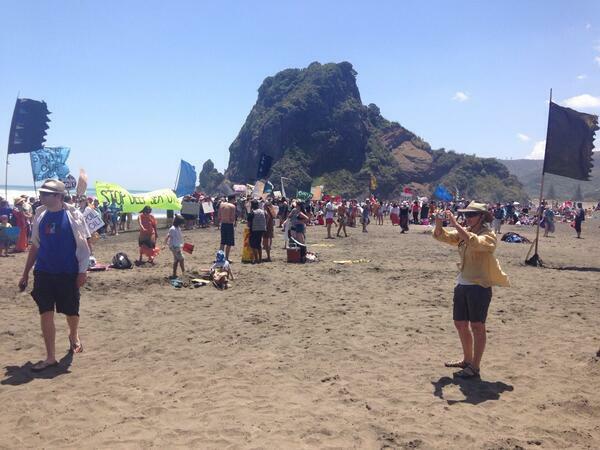 Popular beach, Piha, hosted the main event, with speeches and a haka, which saw over 1000 people attend. Around 400 people joined the protest at Muriwai, 500 at Bethells Beach, and almost 750 at Raglan. Figures for the more than 34 other beaches taking part up and down the country were not yet available. Protesters – who were asked to bring their own homemade banners – carried signs reading: “we love our beaches”, “deep sea drilling is not worth the risk”, and “Anadarko go home”. One of the more inventive ones likened Anadarko to anaconda snake oil. Steve Abel, Greenpeace climate campaigner, said the protest, which begin at midday, was “amazing”. He said people felt “very strongly” against deep sea drilling. “We have this incredible potential for clean energy [in New Zealand], we are actually a power house on clean energy, so it’s just a no-brainer for people,” he said. Many felt the full economic potential and the possibility for New Zealand to become a world leader in green energy would be lost if the government focussed on deep sea oil drilling, he said. If Prime Minister John Key’s cabinet didn’t see that, they have “really got their heads in the sand”, he said. New Zealand women’s national surfing champion Micha Davis and Labour MP Phil Twyford also spoke at the lead event in Piha. 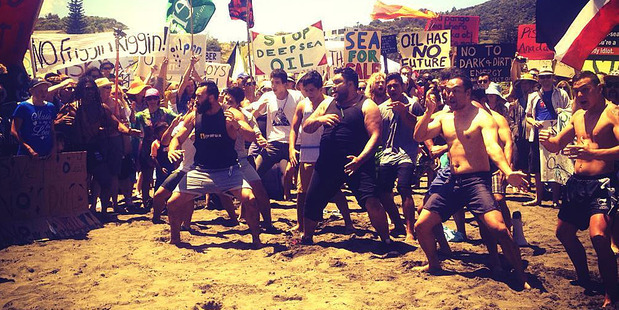 Protesters joined hands to form a human chain from the land to the sea, and a haka was also performed.